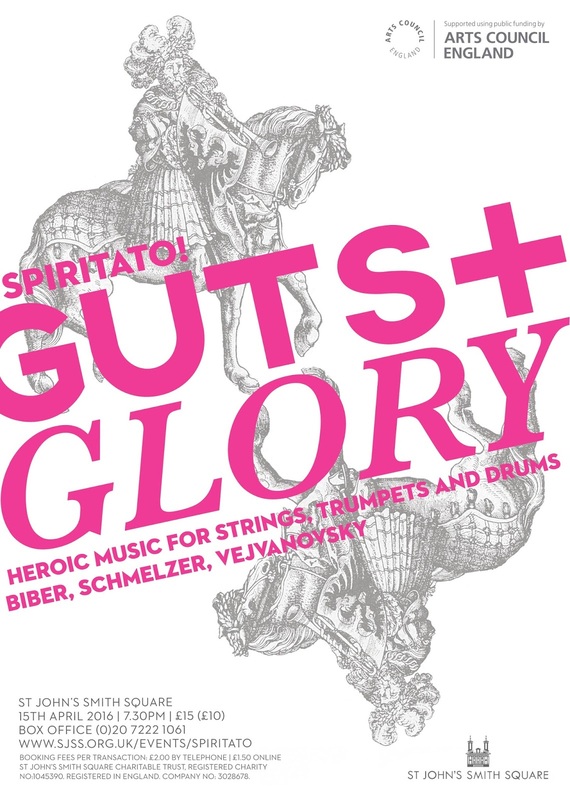 The period instrument ensemble Spiritato is touring the UK with a programme of music for trumpets, drums and strings; military art music written by Biber and Schmelzer. The programme opens at St John's Smith Square on 15 April 2016 and there are further dates at St George's Bristol (9 November 2016), Brighton Early Music Festival (11 November 2016) and Your Early Music Christmas Festival (8 December 2016). The programme includes Biber's Battalia a 10, Schmelzer's Balletto a Cavallo plus music by Vejanovsky and Fux. A distinctive feature of the concerts will be that the group will be using natural trumpets without any of the finger holes or valves which can help players, an idea which is becoming increasingly common with HIP groups particularly on the continent. The results offer intriguing possibilities in terms of the harmonic qualities and temperaments of the music, and require the players to research playing methods and techniques. The performances of Guts and Glory will follow a series of workshops and conferences, aimed at integrating real natural trumpets and equal tension strings into the ensemble. Further information from the St John's Smith Square website.